And just a few miles outside the city, you'll find excellent suburban malls, each with its unique mix of stores, restaurants, and entertainment. 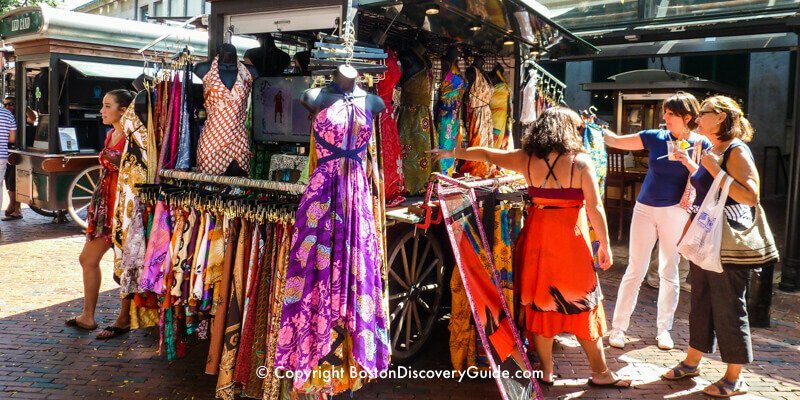 You'll find national brands plus unique local shops. Hungry? 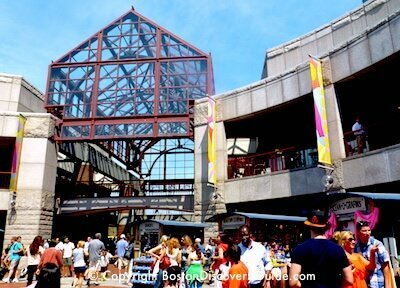 Several top local restaurants, plus 40+ stalls in the Quincy Market Colonnade Food Hall serve up seafood, ethnic, and other specialties. 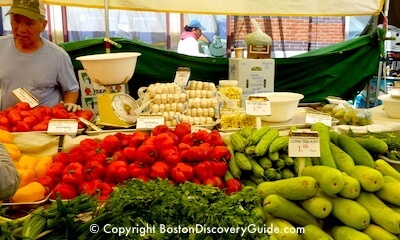 And right around the corner is Haymarket, Boston's historic open air market in Historic Downtown Boston. 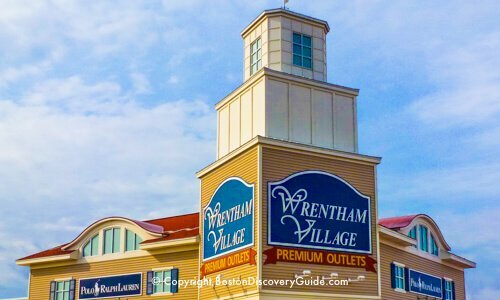 Discount & Outlet Shopping near Boston - 2 Great Choices! 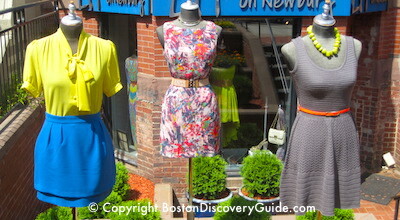 Let's say you have only one day - or maybe just a couple of hours - for a Boston shopping spree. 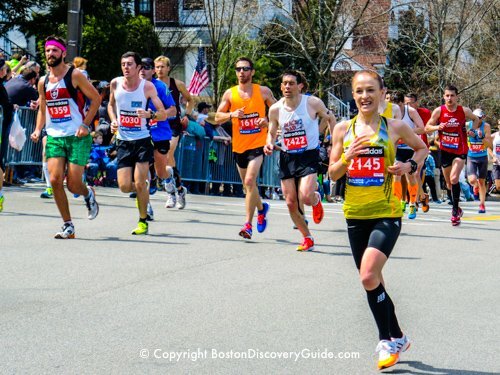 Boston boasts many diverse shopping malls and plazas right in the central city - perfect for icy January, steamy July, and anytime when you don't want to brave the outdoor elements. 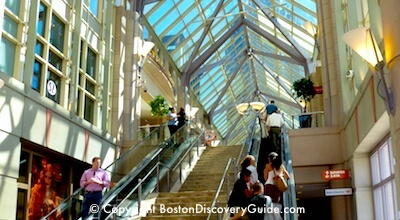 Discover even more malls just outside the city - Cambridgeside Galleria and Burlington Mall. 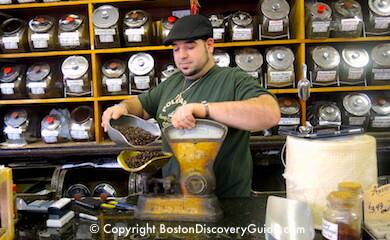 For a wider range of good things to consume on the spot, such as apple cider donuts and George Howell's specialty coffee, walk over to adjacent Boston Public Market (between Hanover and Blackstone Streets), where vendors sell everything from fresh fish to artisan cheeses, with an emphasis on organic and local products. 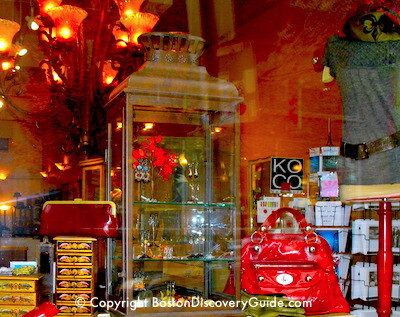 We tell you about each area's specialties - antiques, art, clothing, rare books and maps, concept stores, food, jewelry - and where to find them. More . . .
For a different kind of holiday shopping experience, don't miss Boston's pop-up Winter Holiday Market in City Hall Plaza, complete with an ice skating rink and fun places to eat and drink. More . 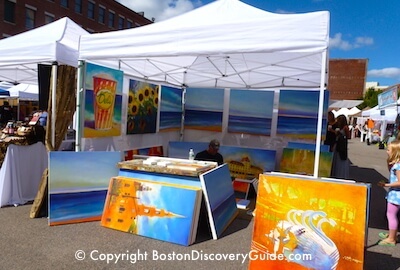 . .
Every Sunday from early May through October, Boston's biggest artisan crafts and design market, SoWa Open Market (shown in photo) attracts crowds of shoppers to its sea of white tents at Ink Block, 375 Harrison Ave, where food trucks, next-door SoWa Vintage Market, and SoWa Farmer's Market round out the offerings. Twice each year, Boston's large art communities in the South End and Fort Point neighborhoods open their studios and galleries for day-long art walks. 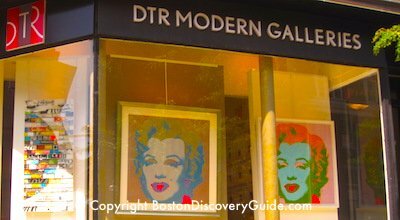 This is your chance to view a wide variety of Boston's best art, talk to the artists, and perhaps acquire a piece you can't resist. 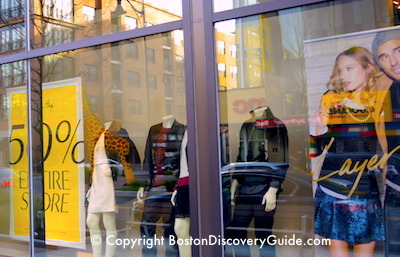 In East Cambridge near MIT, the 3 floors of CambridgeSide Galleria include Best Buy, Macy's, and 120 other stores. Massachusetts sales tax on retail sales of tangible items is 6.25%. Some things, such as food to be prepared at home (in other words, not restaurant meals or carry-out), prescription drugs, and clothing costing less than $175 per item are exempt. Unlike some other cities in the United States, the City of Boston does not levy any additional sales tax on top of the state sales tax. This means that you can save money by shopping for clothing and food items in Boston (and the rest of the state), compared with buying these items in states that charge sometimes as much as almost 10% in sales tax. Most Boston area stores will give you a refund or store credit if you return items with your receipt within a specified period of time. Typically, if you pay with a credit card, the merchant will give you a credit refund, not cash. The time period and other terms vary by store, so make sure you understand their return policy. By law, stores must post their return policy near the cash registers in a place where you can see it. However, many stores will not give a refund or credit or even allow exchanges on sale items. Usually they will tell you or indicate in some way that "sales are final." However, if they don't, you should ask them to explain their return policy BEFORE you hand over cash or a credit card if there is even the slightest chance you might return an item. Almost all larger stores accept major credit cards for payment - Visa, MasterCard, American Express, and perhaps a couple of others. 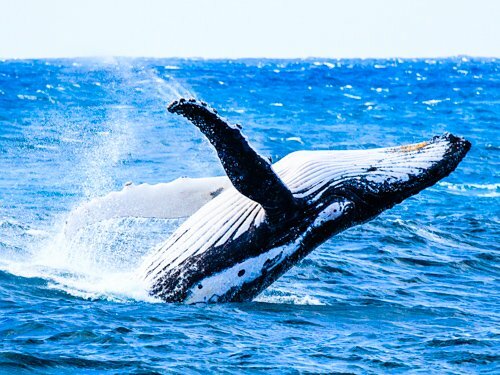 Some smaller stores, restaurants, and other businesses accept only Visa and MasterCard, not American Express or other cards. Other smaller stores and cafes take only cash. Usually, although not always, they post a "Cash Only" sign to let you know. You are most likely to see Cash Only signs in Chinatown, Haymarket (although an increasing number of sellers take credit cards), and some street vendors. You may also encounter a couple of cash only shops and even a few cash only restaurants in the North End.